All baby boomers remember that when a stranger didn’t like how we were behaving, he or she would call us a “juvenile delinquent”. It also didn’t help a boy to dress in a weird way or to comb the hair back in a duck-tail. That was the ‘hoodie’ look of the 1950s and early 60s. Normal boys had crew cut hair styles. But, if you looked like a punk, you were a juvenile delinquent or greaser. Clothes make the man. Appearances count. Yada, yada, yada. 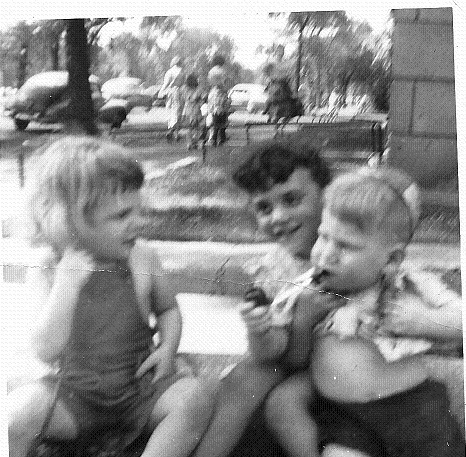 Our Quincy Street block in Austin, on the far west side of Chicago, had a typical mix of kids. There were the ‘dupers’ or nerds (myself included) as well as the greasers. Depending on how old or strong one was, he was either in awe of or downright afraid of the greasers. I was lucky because Jerry, our resident greaser, wasn’t such a bad kid. Yeah, he spitted a lot and was constantly fidgeting with a comb over his hair and hung out with the bad kids on the next block over. But, he wasn’t mean or tried to lord over the dupers on our block. In fact, he more often said (okay, grunted) hello to us and kind of enjoyed the respect he was shown. The juvenile delinquents, I mean- greasers, seemed to congregate in the upstairs MENS washroom at the State Theater movie house on Madison Street. I dreaded having a need to go to the washroom by myself when nature called during a movie. The greasers would commandeer the bathroom sinks because that’s where the mirrors were. There, they stood ground holding combs instead of switchblades. A few powerful and iconic movies made in the 1950s cashed in on society’s fear of juvenile delinquents. “The Blackboard Jungle’, “Rebel Without a Cause”, and “The Wild Ones” were the most notable. Even Jerry Lewis parodied this subject matter with “The Delicate Delinquent”. It seemed that greasers had a certain sense of honor and more often carried only knives and brass knuckles. And they smoked cigarettes. A kid caught smoking in public was labeled a delinquent. Drugs were out of the question because they were mostly inaccessible. Juvenile delinquents committed petty crimes such as shoplifting, rolling a senior citizen in the street for cigarette money and stealing hubcaps or entire cars for a joy ride. By the mid 1960s, hair styles change and Beatles cuts are now in fashion. Even Dupers ignore the US General Surgeon warning that smoking cigarettes is linked to cancer. Acid laced drugs and funny looking cigarettes are in vogue and not just for delinquents or greasers. In fact, the greasers seem to disappear. Or maybe they are shipped out to Viet Nam to help protect us from the Domino Effect. That all seems so minor league today with the Monday morning scorecard in the daily newspapers on how many drive-by shootings during the previous weekend leave so many dead or maimed for life. Nowadays, gangs of kids roam the streets looking to terrorize even in public areas such as Chicago’s famed North Michigan Avenue. In 1955, a public service documentary is presented to showcase the problem of juvenile delinquency. The narrative offers no clear solutions on how to stop bullying, intimidation and crime other than to encourage teenagers to stand together against the bullies. Unfortunately, it doesn’t work today because the bullies shoot first and don’t bother to ask any questions after, either. Watch the video clip and get a feel for how innocent we seemed back in 1955. Previous Previous post: Why is There No WPA Today?